“So, why are Brann and Stord rivals? Is it just a coincidence, or is it more behind it than we already know?” our sports journalist Alejandro Cassillas asked. “Truth be told, it’s far more than a mere coincidence. You see, myself and the manager of Stord are more than just rivals…” Eilanda said, and took a brief and dramatic pause. “We’re even related. By blood. He’s my father” Eilanda said to a flabbergasted Cassillas. “What!? I’ve never heard of this, you never mentioned any of this in the locker room back in the day! [Cassillas played for SKB before his current TBJ commitments — Ed.]”. “Well, I need a cup of coffee, maybe even some smelling salts after this. Thank you for your time Eilanda”. Also, Jes ‘Kniksen’ Steinicke got his long-awaited testimonial match the 28th of May, and had a final goodbye to the fans. For the time being, Steinicke won’t have a position in the club, however, he isn’t completely out of the picture for that matter. Steinicke started up his aviation company “Steinicke Airlines” a few seasons ago, and have for the last two seasons served as Brann’s general sponsor. This pre-season he extended the sponsorship deal for another year, meaning the company logo will continue to pride the Brann kit this season. For the first games of this season Brann have played with last seasons kit set, but will introduce the brand new kit set in today’s league fixture against Loppa. 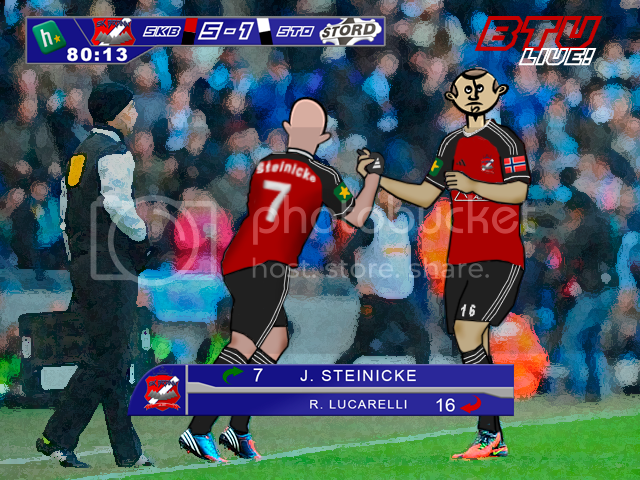 At the end of the testimonial match, Lucarelli left the field for Steinicke to come on, to a standing ovation from the attendance. Lucarelli netted two goals this game, and dedicated both of them to his long-time mentor. I am a manager/HTU editor from Northern Norway, and my team is SK Brann, both in real life and in the fantastic world of Hattrick. With every day that passes, I learn more about this addicting little game I found back in 2007, and for every day goes by, the love for it grows. I enjoy writing stories about my HT-team, and to make more out of the regular game. With over twenty-five in-game seasons of experience, Brann have the ambition of reaching the top division of Norway, Tippeligaen. I really like how the HTUM logo appears as you initially log on to this blog, and then is replaced by the SKB red design. Great idea. I only wish my blog dashboard would let me work on posts, design etc. :((( Everything about this post and the imagery I love. Brilliant. And for Wix/etc. users, I’m pretty sure there’s plugins that allows you to make a feed pretty easily could be wrong though. thanks for your reply on the other post. I would like very much to enter the HTU fed but for now the ht’s does not deserve my money. With a pricing policy so wicked they have destroyed the user-base and the community of the game ( I imagine that also your federation slowly emptied… ). however, I do not exclude that one day might return to pay, but depend largely on the their project of development: in that case i’ll enter for sure in your fed.